Ben Lloyd had dreamed of owning an oyster farm since 1996 when he worked for Moonstone Oysters as a URI Marine Affairs student. He decided to first get into the wholesale side of the shellfish business. So in 2001, he founded Pangea Shellfish Company, a distinguished oyster and shellfish wholesaler. Selling oysters was exciting, but Ben still yearned to be an oyster grower. Nine years later, Ben finally fulfilled his long-time dream by purchasing a small oyster farm in Duxbury Bay. Ben decided to name his farm Standish Shore Oyster Farm after the peninsula southwest of the farm site where the Standish Shore Monument stands looking over Duxbury Bay. Ben seeded the farm with 400,000 oysters for the first growing season. He would hit the tides each day, before or after working at Pangea. 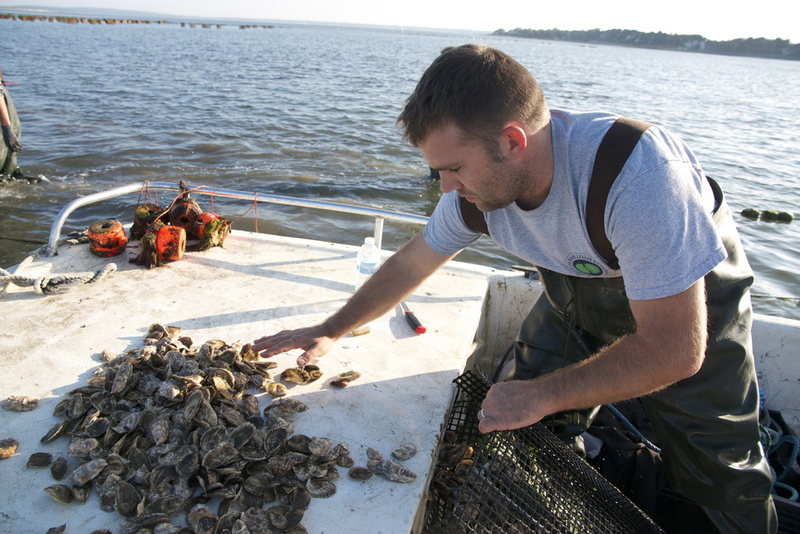 After a tough couple of years, Ben and his team harvested the first crop of Standish Shore Oysters in 2012. They were thrilled with the oysters' quality and flavor, and Pangea's customers seemed very happy too. It was time to buy more gear, more seed, and increase production. Ben and his farm manager, James Kearns, lead a crew year-round, and together they grow more than 2.5 million oysters each year. The farm produces four different grades of oysters. Click below to learn more.